Sveti Stefan is the most luxurious resort in Montenegro and one of the most luxurious resorts on the Adriatic Sea. 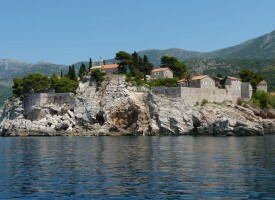 The island of Sveti Stefan was connected to the mainland by a causeway and turned into a peninsula. In the fifteenth century, the island was settled as a fishing village and half-century ago it was converted into a unique hotel-town. Among famous people and statesmen who visited Sveti Stefan are: Timoshenko, Grechko, Kirilenko, Jakubowski, Malraux, Moravia, Yuri Gagarin, Mikis Theodorakis, Sofia Loren, Monica Viti, Marina Vladi, Kirk Douglas, Sergei Bondarchuk and Sylvester Stallone. Recently, Aman Resorts Sveti Stefan modified the island in a way to preserve the historic ambience of the island as it existed for centuries. Streets, walls, roofs, house facades kept their original shape, but inside one can find the most modern and most luxurious hotel comfort. Aman Sveti Stefan offers 58 accommodation units, 50 rooms, apartments and houses on the island and 8 apartments in the Villa Miločer, as well as a diverse selection of restaurants in a unique setting. One of the most popular weddings – the wedding of the tennis champion Novak Djokovic with Jelena Ristic was held in 2014 on Sveti Stefan in 2014. Getting from Sveti Stefan to the restaurant Giardino takes less than ten minutes by car.